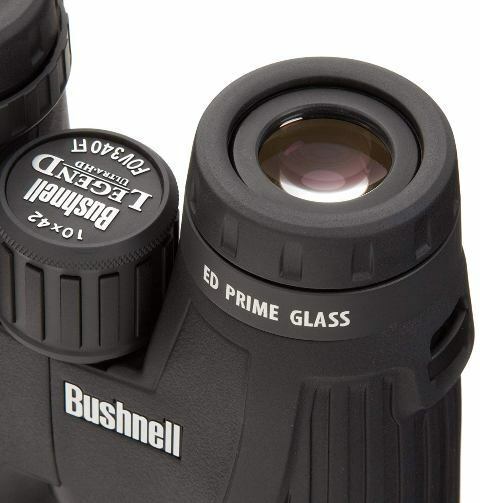 A must-have for any great outdoors experience is a good pair of binos. We all wish for a good quality pair to take out with us. And really there's a lot of good quality out there. The problem is that they may be a little out of our price range. So how do you get a good quality pair on a small to medium budget? Well, you no longer have to worry about the answer to that. This pair has superb optics. The ED (extra-low dispersion) glass ensures that you get higher resolution on your photos while the Ultra-Wide Band anti-reflective coating makes sure that you get brighter images. All these make sure it works great in low light and strong light. 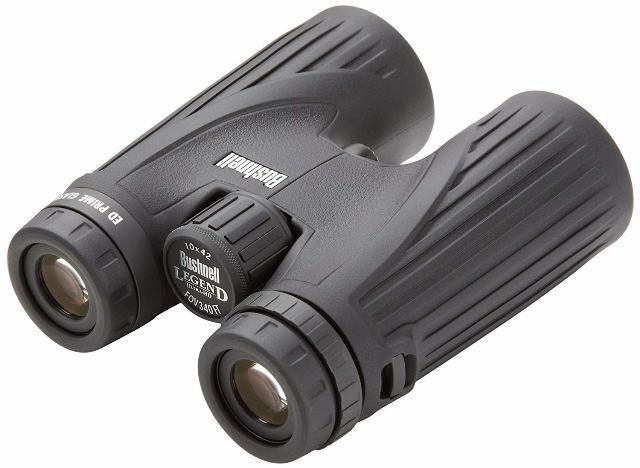 This combined with the 10×42 magnification will give you vivid sharp images of the beautiful wildlife all around you. Plus, you won't have too much trouble hunting with this pair. Despite the increased magnification, you can focus just fine while still being steady. 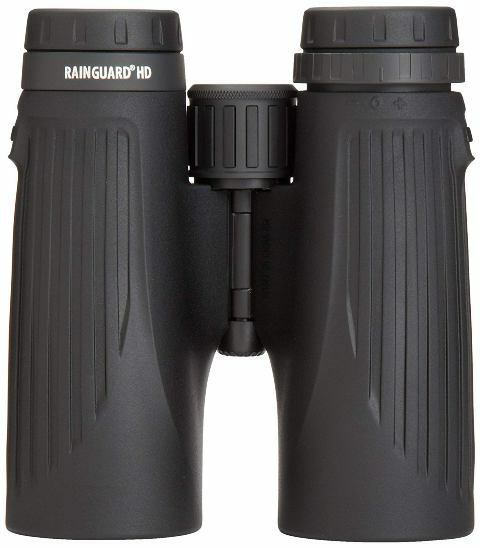 These binos come with Rainguard HD. This is a water repellant coating on all your lenses. Meaning that they can be used in light rain, snow, and general wet conditions. The moisture on your lenses beads up letting you still get a clear view. They're fog free too. Try breathing on them. Your lenses will take some time to clear up but it will be faster than with most binoculars. If you dropped them in muddy water or any murky stuff, fear not. They're waterproof so you can just clean them with some running water and move on. Also, they come with a soft cleaning cloth for ease while cleaning. Lastly, the protective covers for the objective lens will make sure that no dust or scratching will damage your lenses. 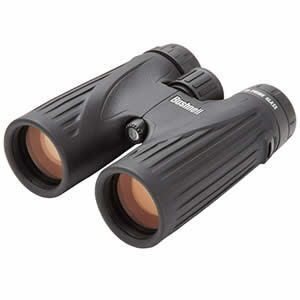 At 25.7 ounces these binos are pretty lightweight. Plus, they have a wonderful soft grip that makes them ideal for use over long periods of time. They also come with a padded neck strap and for those who feel that neck straps put too much strain on their necks, they come with a harness. You get to take the weight of your neck. The best part is that you can switch between the two at any time you want. Your outdoor expedition just got way more comfortable. The twist up and down eyecups makes it easy for users to adjust the eye relief to what suits them. This will make them more comfortable for prolonged use, especially for those who wear eyeglasses. The close focus distance is at 6.5 feet. This will be convenient for those who want to enjoy watching birds and insects close by without disturbing them. Its central focus knob has a very smooth focusing adjustment. It takes a relatively good time to move from zero to a higher focus. This means that you can keep up with moving animals. The best part about the diopter adjustment is that it locks. For those with a difference in their eyesight, you only have to adjust it once and as long as you don't share your pair, you're good to go. But even if you do, it's a pretty simple process to adjust it back. Q: There's a squeaky noise whenever I use my binos. Should I lubricate it? A: No, please don't. It's a bad idea. Try using the rubber band and if that doesn't work consult the manufacturers. Q: Does it come attached with anything? A: Yes, it does. It will come with a carrying case, a spacious bag, a neck strap and a harness for ease of transportation. It will also come with a soft cloth for cleaning. People have paid more money and essentially received less than what they paid for. 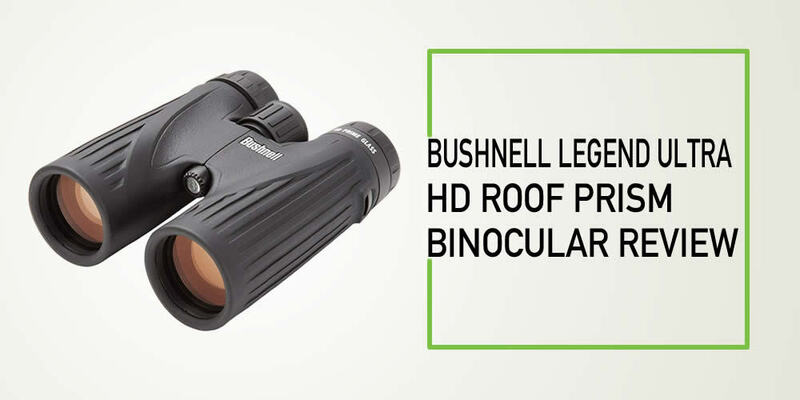 With Bushnell Legend Ultra HD Roof Prism Binocular you get the exact opposite. Pay less to get much more. The great outdoors will be enjoyed to the fullest with this gem.